You’d think I’ve been on summer vacation, what with your Convivio Book of Days calendar for August coming so late, but no. Life has just been hectic, nonstop, go go go, which is not the way August is supposed to be. August is supposed to be sandwiches at the picnic table out back and trips here and there, big trips or maybe just little excursions. 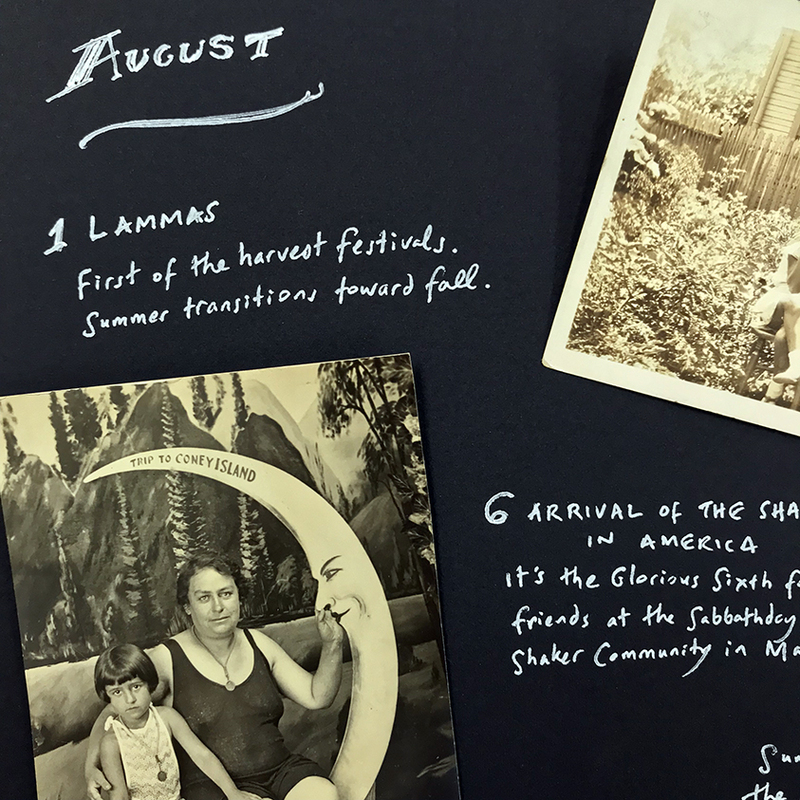 And so that’s the August we’re giving you this month on the calendar. Cover stars include my mom, Millie, and my Aunt Anne, when they were little girls. The year is 1930 or so and they are sitting in the backyard with Grandma, eating sandwiches, just as August beckons us to do. It is the month of Lammas, which has passed, but still to come are Obon, the traditional summer holiday of Japan, which in some prefectures comes in July and in others in August, but I have always been more of an August Obon kind of guy, for that is the time we celebrated it here (though even that has changed). And still to come as well is Ferragosto, the holiday of Italy that comes with the Feast of the Assumption of the Virgin Mary, the Fifteenth of August. It is the day that same grandma of mine was born, back in 1898. Each year for the Assumption we would eat the traditional cucuzza longa, the odd long squash that actually is a gourd. So far this month I’ve had no luck finding it in the markets but my hopes are high, for there are still a good many days to go before the 15th. And later this month, the Bartlemas Wayzgoose, a day of great importance to all of us book artists. Whether we be papermakers, letterpress printers, or bookbinders, St. Bartholomew is relevant to us all, and so his feast day is one we have been known to honor and honor well. 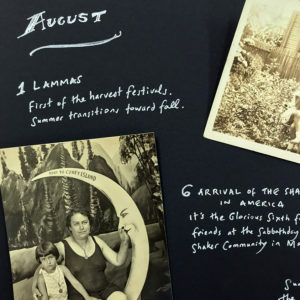 Locally, here in South Florida, the place to do this this year is at the Jaffe Center for Book Arts in Boca Raton, at Florida Atlantic University’s Wimberly Library. We’ll be part of the big Library Wayzgoose Festival that is taking place there on Saturday, August 25, from 10:30 to 5:30. One of my favorite printers, Ben Blount from Evanston, Illinois, will be featured with print shop demos and a gallery talk, and there will be live music all day (I know, libraries are supposed to be quiet… but not on Wayzgoose day) and we’ll be making printers caps from paper and there will be games and fresh baked artisan breads for sale from Louie Bossi’s in support of the Jaffe, and the works of about 20 local makers and small creative companies like ours will be on display, too, for your small-shopping pleasure. It’s going to be a lot of fun, which is only natural: “Wayzgoose” is a fun word to say, so what else would it be but fun? 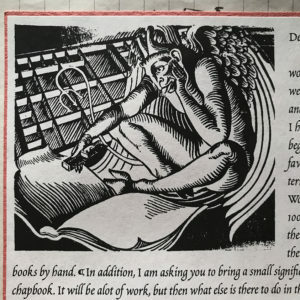 The St. Bartholomew’s Day Wayzgoose connection to book artists goes back many centuries… something I’ll certainly tell you about on the blog later this month. For now, get out there and enjoy what’s left of summer. It won’t be long before we start thinking thoughts suited to cooler months. Most all the printers I know (and as a letterpress printer myself, I know a lot of them) are a salty bunch who are never lacking for good stories, creative profanity, and a hankering for a beverage with spirit. And here, on this 24th of August, comes a spirited celebration just for us printers. It is Bartlemas: St. Bartholomew’s Day, known also as St. Bartlemy’s Day. It is the traditional date of the celebratory printers’ Wayzgoose. Wayzgooses (Wayzgeese?) nowadays are celebrated all year round at the various places where letterpress printers congregate (we’re taking part at a Wayzgoose in Boca Raton, Florida, on October 14; you should come! )… but years and years ago, Bartlemas and the Wayzgoose went hand in hand. The Wayzgoose is a particularly English celebration, one that comes out of the shifting of the seasons. By the time we reach Bartlemas in the seasonal round, we are a full eight weeks past the summer solstice. Sunlight is waning: the autumnal equinox is just a month away. With it, day and night are equal, and once it passes, darkness overtakes light. In the days before glazed glass windows, Bartlemas was also the signal that it was time to paper the windows in preparation for winter. Once the windows were papered, it was also time, once again, to illuminate the print shop with lanterns and candles. For papermakers and printers both, Bartlemas was an important time of year. Not to mention the bookbinders, as well: St. Bartholomew is a patron saint of book artists and bookbinders. This comes from his martyrdom: St. Bart was one of the original Twelve Apostles, and he met a bitter end, flayed alive and crucified upside down. 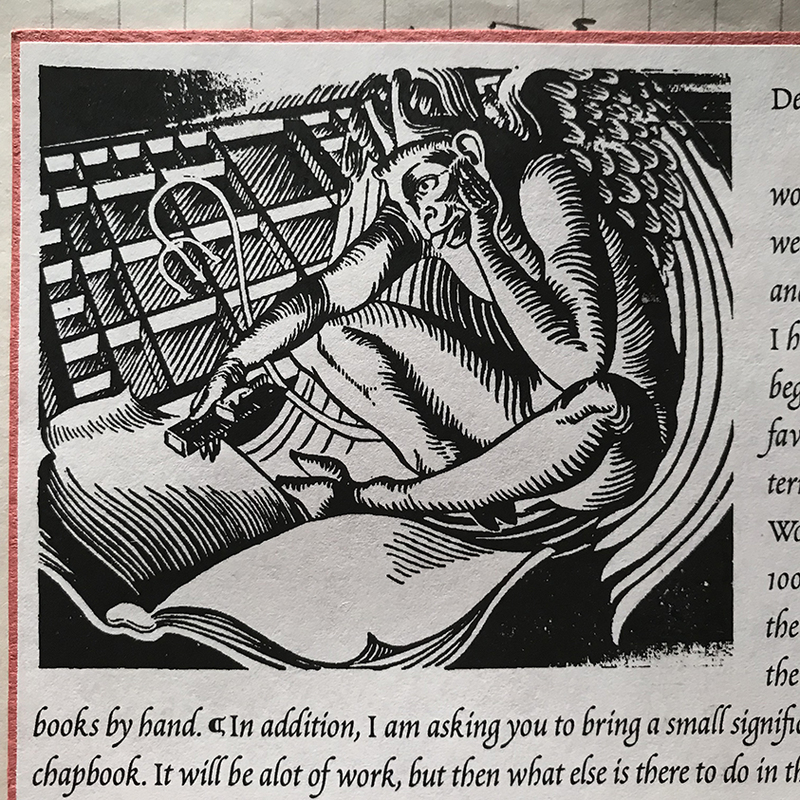 The flaying has made him a patron saint of butchers, tanners… and the bookbinders, too, for they typically bound books in leather. He is also a patron saint of cheesemakers and beekeepers: the honey harvest typically begins at Bartlemas. In Cornwall, mead is blessed on this day. But back to the printers. 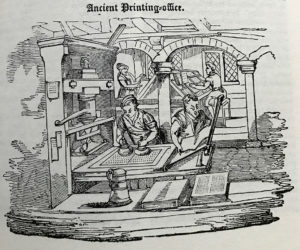 Randall Holme, in 1688, gave us this description of the Bartlemas Wayzgoose: “It is customary for all journeymen to make every year, new paper windows about Bartholomew-tide, at which time the master printer makes them a feast called a Wayzgoose, to which is invited the corrector, founder, smith, ink-maker, &c. who all open their purses and give to the workmen to spend in the tavern or ale-house after the feast. From which time they begin to work by candle light.” It is, no doubt, a day with a long history of tavern printshop talk and robust drinking songs, hearty laughter and good cheer. For all involved in the Black Art: printers and printers’ devils both. 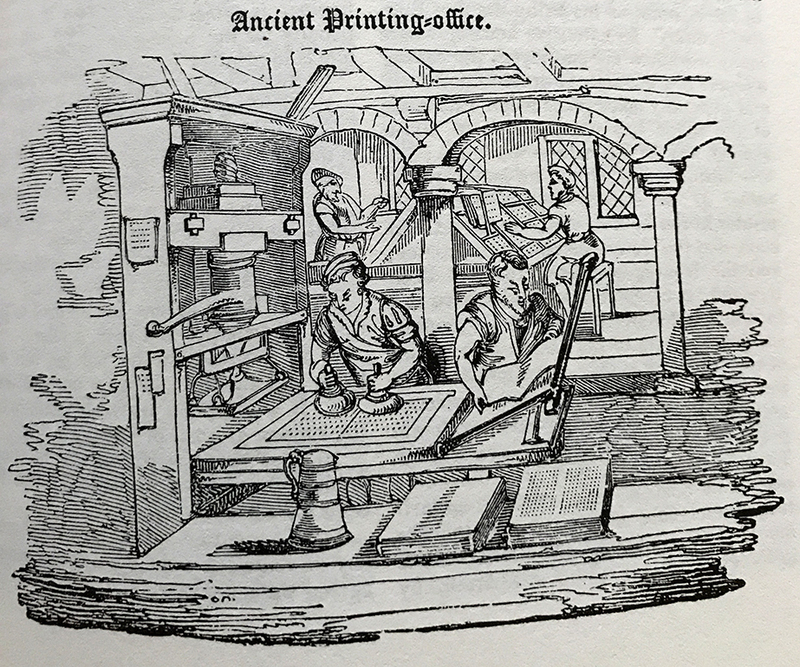 Image: Ancient Printing-Office engraving from The Every-Day Book by William Hone, London, 1827.